When you pay hundreds for your hair color, it's a shame to watch it fade in a matter of days. That's why color-safe hair products were developed. It may seem easy just to buy what your stylist recommends, but if you're looking for something vegan or just something more affordable, check out your local health food store. 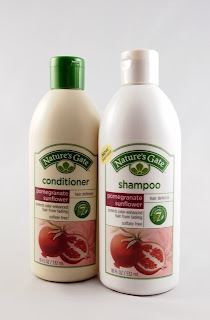 Nature's Gate offers one option for vegans: the Pomegranate Sunflower Shampoo and Conditioner. This shampoo and conditioner set is very similar in texture and fragrance to conventional products. The pomegranate is a nice fruity scent, but it might not be suitable for men. These products were nourishing, which is ideal for normal to dry hair types or for use a few times a week. Both the shampoo and the conditioner rate a moderate 4 on the EWG Skin Deep database. The main ingredient that weighed this down was the fragrance, but Nature's Gate specifies that it is phthalate-free. I have a bit of henna in my hair, and these products seemed to keep it at its current color (didn't fade it). However, I didn't test it with conventional (chemical) hair colors. I love how Nature's Gate is a vegan company, and proudly displays it. If you're looking for a vegan alternative (or just a more affordable one) for color-treated hair care, check out these Nature's Gate products. Also available on Amazon.com: shampoo and conditioner. Disclosure notice: This product was purchased by the reviewer. However, the manufacturer has sent me products free of charge for review purposes in the past. No additional compensation was accepted and the opinions are my own. Please verify any claims with the manufacturer, especially if you have any allergies or concerns.